Rockbar’s “In The Round” with Host SHAWN JOHNSON & Friends! 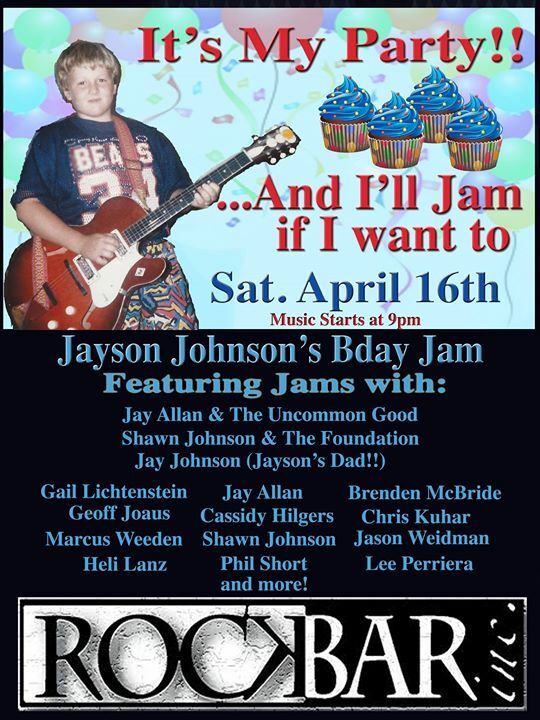 We’re throwing a party for Jayson’s birthday in a couple weeks, but with a twist…..Jayson will be playing all night with a few of the different bands or musicians he’s played or jammed with over the past few years….there’s gonna be some fun sit ins and special guests, and some unique tunes and jams for the night. There will be two sets throughout the night by Jay Allan and The Uncommon Good as well as many sit ins from members of The Uncommon Good throughout the evening….show will start at 9pm to fit it all in! Gonna be a good time…. In The Round” with Host HALEY GRIGAITIS & Friends! In The Round with host JAY ALLAN & Friends! “In The Mood” with THE BLACK MOODS!! “In The Round” with Host HALEY GRIGAITIS & Friends! First Thursday’s Friends & Family Acoustic JAM!! “In The Round” with Host SHAWN JOHNSON & Friends!